Preheat oven to 200°C/ 390°F. Cut potatoes, carrots, onions, and apple into 1 cm dice. Now, marinate potato, carrot, onion, and apple dices with olive oil, salt, and pepper. Finely chop garlic, rosemary, and thyme. Combine chopped herbs, sweet paprika powder, olive oil, salt, and pepper in a small bowl to create a marinade. Brush chicken with the marinade on the inside and outside. Fill the cavity with previously marinated vegetables. 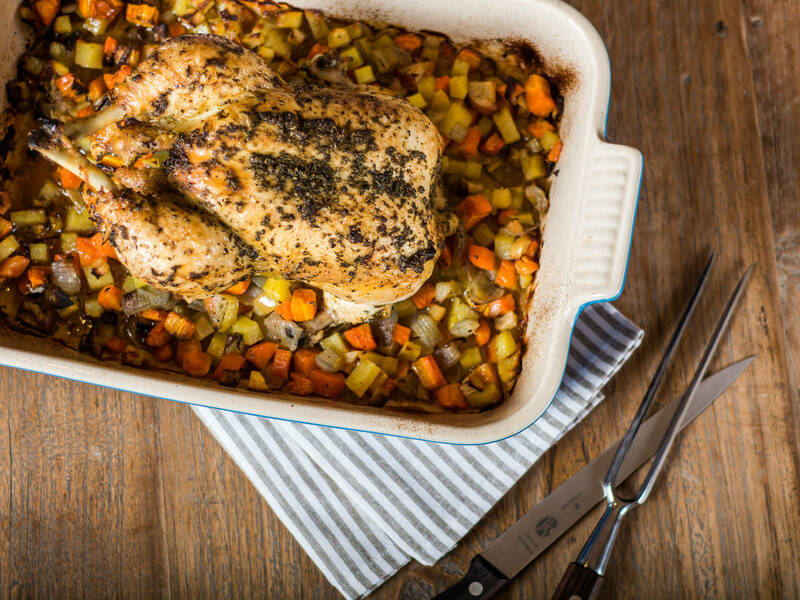 Place chicken in a baking dish and arrange the remainder of the vegetables around the chicken. Cook covered with aluminum foil in a preheated oven at 200°C/400°F for approx. 40 – 50 min. Then uncover and finish cooking at 170°C/335°F for approx. 30 min.